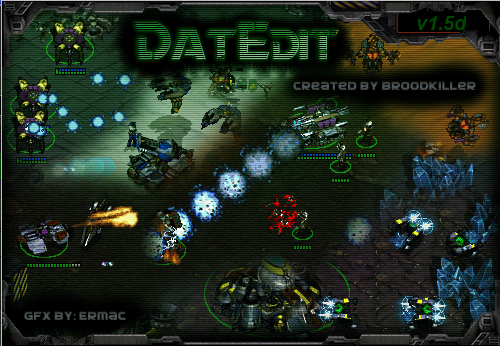 DatEdit v1.5d, the last released version of DatEdit to my knowledge, by BroodKiller. 2)...and that's it! Run "DatEdit.exe" and start using the program! 1)You can move both the executable (DatEdit.exe), the accompanying libraries (DLL files) the config file ("DatEdit.ini") and the data folders ("Data", "Default" and "Formats") wherever you want on your disk - this is of no problem as long as they are all together. DO NOT separate them, as this will mostly result in DatEdit refusing to work properly. 2)The content of the "Data" folder are just plain text files, that are used for various listings in the program. Feel free to edit these text files but unless you REALLY know what you're doing (or if you're updating some listings) it is advised that you leave them the way they are. DO NOT remove any file from the "Data" folder. The results may be the same as above. The application that you just put your hands on, DatEdit, is a *.DAT files editor. These files are the major data files used in the award-winning Blizzard RTS game Starcraft and they control multiple game properties, ranging from units&weapons statistics (health points, movement, damage, targeting), through display-related stuff (unit graphics, palette setting, animations used), to end with certain AI-related options. When compared to the previously available modding tools (such as Arsenal3 or Arsenal Zero), it may seem that DatEdit is not a breakthrough achievement. You can take Arsenal3 and say: "The GUI is almost the same - why should I switch over to DatEdit?". You can take Arsenal Zero and say: "I can get the same results with AZ, why should I even bother trying DatEdit?" 1-DatEdit has a Graphical User Interface (GUI). Although we all love Arsenal Zero, editing raw text files may get tedious at times. DatEdit has a clear and straightforward interface that allows quick and easy editing of the desired DAT properties without scrolling and using the Find function all the time. 2-DatEdit has updated listfiles for all DAT files. "Hmm...Unknown85 points to Unknown465 which points to Unkno...." - In DatEdit this is no more! 3-DatEdit has full format support. When compared to Arsenal3, and even AZero, DatEdit has many of the previously unknown properties researched and properly labeled. For more, some of them are present only for certain specific entries, and this too is perfectly reflected in the program. 4-DatEdit does not corrupt files. Virtually, because you never know, however at its current stage DatEdit is probably 100% stable. 6-DatEdit's source code is publicly available. While this is a completely different story, DatEdit's source code is released under the GNU Public License, and you are free to download and look into it. No profit can ever be generated from it, in any way, as it is supposed to be free to everyone. See you making great mods with DatEd!